I got this note from reader Beth Nickel. Thank you Beth for introducing me to Purple Monday! I think it is important that we are all aware, and that because we can't usually see physical signs of epilepsy it exists and affects so many people. I encourage my fellow bloggers to spread the word of awareness even if you don't know a single person with Epilepsy. I am honored to help spread awareness, and educate people about Epilepsy. Your cake for your group turned out wonderful! Thanks for sharing it!! Thanks to Christine for helping to bring awareness to what March 26th means to more 50 million people worldwide!!! 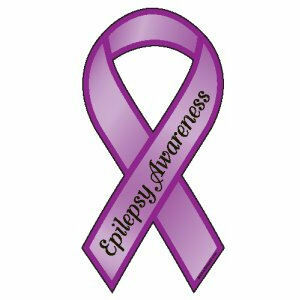 March 26th is Purple Day (Epilepsy Awareness) worldwide. It is a chance for those of us who fight Epilepsy to say this is who we are, this is what happens to us and those we love. We are your neighbors, co-workers, heck sometimes you are married to an Epilepsy fighter (for those that are you are a warrior as well)! Purple is the color for awareness and research. We also celebrate an Awareness month in November. 1 in 10 people will have a seizure in their lifetime, but it takes more than one seizure to be diagnosed with Epilepsy. After the diagnosis the real fight begins, fighting for control of seizures, fighting for acceptance from those who were your friends last week but now think that you are "possessed" or that Epilepsy is "all in your head". Here's a NEWSFLASH, we keep our brains inside our skulls, so you are right....it is in our heads, but we do not imagine it. I could give you a bunch of dry stats, but I think it is better for you to "meet" some of the people I consider my Epilepsy family. My name is Beth, I have been diagnosed for 29 years and am one of the lucky ones, monotherapy (one medication) works for me and gives me really good control. It's nice to meet you :) I look the same as you do, but have heard thousands of times -"you don't look Epileptic" - never have figured out what Epileptics look like!! There are many in the community who will never have the control I do, even with a myriad of medications, surgeries and different therapies. My friend Jodi, is a mom, she had 2 wonderful little boys who both were diagnosed with Epilepsy. Jodi had to face SUDEP(Sudden Unexplained Death due to Epilepsy) when her eldest son passed away due to Epilepsy. She is not the only person in my Epilepsy family who has had to bury a child because of seizures. There are quite a few more, not only in my group, but in other groups all over the internet. And those are the parents who have the bravery to speak out and educate other parents about the dangers How many more don't or can't speak out?? Her son was one of about 50,000 people who died that year due to complications from Epilepsy. Others parents have to fight for doctors to listen, to help their children, to find out the problem so that their children can have a more normal lifestyle. There are many parents who live with that fear every day, the fear that the next seizure will take their child, or do so much damage that their child will still be alive but "not there" anymore. Two of my friends, have not gone even a week without a seizure in years, they are both moms with young kids, which makes their battle even harder. One is a nurse, her passion is about helping others who are in pain and are sick, she cannot even work anymore because her seizures have amped up. She is on 6 medications and has recently had a VNS (Vagus Nerve Stimulator) implanted. This is a "pacemaker" for the brain, but even so she is not gaining control! The other is currently in the hospital because they have not been able to give her control and so is spending more than a week away from her young son. This is in the hopes of finally finding out why she is having so many seizures, but this is not a promise of help, only a whisper of hope. Another young woman, who inspires others around her is a single mom, who goes to college, raises her son and helps raise her younger siblings, she never lets her Epilepsy get her down and lives each day as positive as possible. These are only 4 people that I am in contact with daily, who fight Epilepsy, who stand up and help others as best they can. In my group there are spouses as well, who help their partners daily, whether it is driving them to doctor appointments, helping them recover from seizures or dealing with the helplessness that oftentimes comes with uncontrolled seizures. I think it is harder on them sometimes because they, like parents, have to watch someone they love have seizures and deal with all the "side effects" of the seizures and medications. I guess what I am trying to say on this day is this- Epilepsy is a tough fight, tougher for some than for others. Some cannot speak up because of the fear they experience from past bullying, and some like me who stand up and are loud about it. Not all Epilepsy is the seizures you see in the movies, the grand mals; the scary ones. Most aren't actually, and some you can't really tell unless you know that person has epilepsy. There are more than 30 different kinds of seizures, ranging from the absence to the tonic-clonic(grand mal), but they are all Epilepsy regardless of how visible the seizure is. There are more than 50 million stories out there I have given you only a tiny glimpse of who they are and what their fights are...this is not a complete glimpse even, maybe only the blink of an eye really. All we ask for is understanding and that we are treated with the same respect as anyone else. Education is important to removing the stigmas we endure, and people like Christine who may not be touched personally by Epilepsy, but still are concerned with education and awareness help us move this forward. I thank you for your time on this wonderful Purple Day!! Now go COOK something PURPLE and deliver it to a local Epilepsy support group!! !